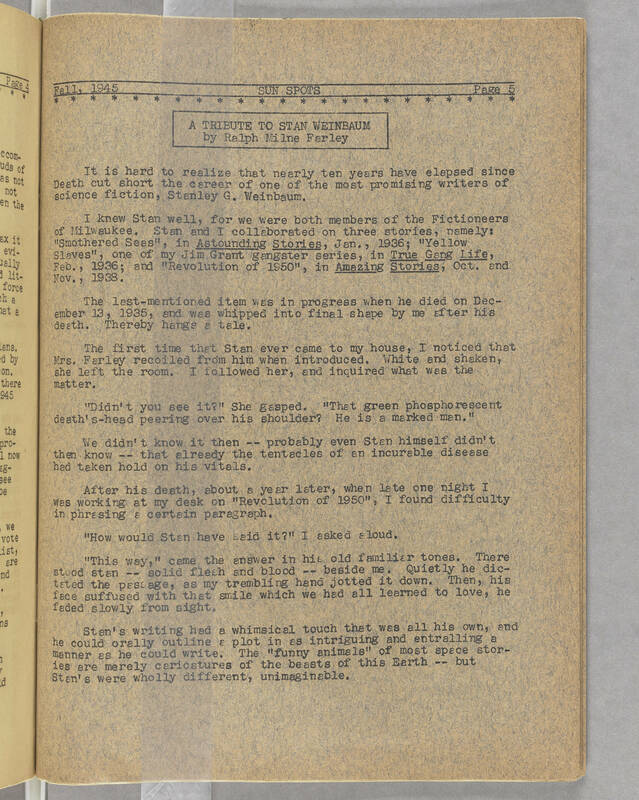 Fall, 1945 SUN SPOTS Page 5 A TRIBUTE TO STAN WEINBAUM by Ralph Milne Farley It is hard to realize that nearly ten years have elapsed since Death cut short the career of one of the most promising writers of science fiction, Stanley G. Weinbaum. I knew Stan well, for we were both members of the Fictioneers of Milwaukee. Stan and I collaborated on three stories, namely: "Smothered Seas", in Astounding Stories, Jan., 1936; "Yellow Slaves", one of my Jim Grant gangster series, in True Gang Life, Feb., 1936; and "Revolution of 1950", in Amazing Stories, Oct. and Nov., 1938. The last mentioned item was in progress when he died on December 13, 1935, and was whipped into final shape by me after his death. Thereby hangs a tale. The first time that Stan ever came to my house, I noticed that Mrs. Farley recoiled from him when introduced. White and shaken, she left the room. I followed her, and inquired what was the matter. "Didn't you see it?" She gasped. "That green phosphorescent death's-head peering over his shoulder? He is a marked man." We didn't know it then -- probably even Stan himself didn't then know -- that already the tentacles of an incurable disease had taken hold on his vitals. After his death, about a year later, when late one night I was working at my desk on "Revolution of 1950", I found difficulty in phrasing a certain paragraph. "How would Stan have said it?" I asked aloud. "This way," came the answer in his old familiar tones. There stood stan -- solid flesh and blood -- beside me. Quietly he dictated the passage, as my trembling hand jotted it down. Then, his face suffused with that smile which we had all learned to love, he faded slowly from sight. Stan's writing had a whimsical touch that was all his own, and he could orally outline a plot in as intriguing and entralling a manner as he could write. The "funny animals" of most space stories are merely caricatures of the beasts of this Earth -- but Stan's were wholly different, unimaginable.